The first thing to know about the American pit bull terrier is that he's a dog surrounded by controversy, confusion and misinformation. He's often confused with the American Staffordshire terrier, a similar dog, but of a different bloodline. Also referred to as the APBT, the American pit bull terrier is sometimes considered to be a vicious dog, which is usually far from the truth, given his natural, affectionate disposition. You may think you know a pit bull when you see one, but you could be confusing him with an American Staffordshire terrier. 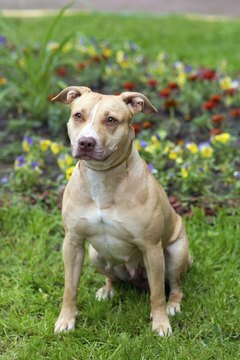 The American pit bull terrier is the smaller of the two dogs, usually weighing up to around 60 pounds and standing between 17 and 21 inches at the shoulder. Typically longer than he is tall, he's almost all muscle and has a medium-length head, a long, wide muzzle and a flat, broad skull. His short, low-maintenance coat comes in a range of colors, including black, white, tan, brown and brindle. The American pit bull terrier was used as a fighting dog, a past that continues to dog him. Unfortunately, some people still breed and use the dog for fighting purposes, perpetuating his reputation as an overly aggressive dog. To be sure, this is a dog with a prey drive -- he was also a ratter in his early days -- so living with cats, small dogs and other small animals may be too much of a temptation for him. Generally, this is an affectionate, friendly dog who is loyal to his family and good with children. Since he's such a strong dog, the American pit bull terrier requires firm, consistent training so he doesn't pull his handler on his daily walks. He's also energetic, so those daily walks should be long or include a run or bike ride. His strength, energy and eagerness to please make him a good candidate for agility, tracking and pulling carts and wagons. Leaving him the backyard to his own devices may frustrate or bore him, leading him to dig or chew. The American pit bull terrier is a robust dog, with a life span of around 12 to 14 years. He is vulnerable to conditions such as hip dysplasia, kneecap location, degenerative myelopathy and skin problems such as allergies and mange. His short coat requires minimal maintenance; weekly brushing will minimize shedding and he'll need a bath if he gets especially dirty on an outing. Some municipalities have laws or ordinances about owning an American pit bull terrier. As well, some insurance companies will not provide homeowner's insurance to owners of certain breeds, including pit bulls. Do your homework to ensure your insurance company and municipality approve of your choice in dogs.